Quickly and easily prepare delicious Philly cheesesteak sandwiches with this Kraft CHEEZ WHIZ cheese spread! It combines cheddar and Colby cheeses with zesty hints of Worcestershire sauce and mustard for a tangy, signature flavor. Compared to other types of cheese sauces, this cheese spread has a slightly thicker consistency and is ideal for spreading onto your flavorful sandwiches and subs. It can also be used for stuffed potatoes, soft pretzels, cheese fries, dips, and loaded nachos! Yellow-orange in color, this cheese spread can be heated in the microwave inside or outside of its easy-pour bag for quick preparation. The 6.5 lb. bag of cheese sauce is great for preparing order after order of appetizing, cheesy entrees and snacks, and it's simple to use! Compact for storing and stacking, this bag is easy to heat up and pour so you can begin preparing savory sauces and cheesesteaks right away. With so many options, you'll want to keep your restaurant or concession stand in good supply of Kraft CHEEZ WHIZ cheese spread. Kraft is one of America's leading brands of packaged foods and cheese products to meet your foodservice needs! We love Cheez Whiz, we go through approximately 1-2 bags per day on cheese fries. Webstaurant double-boxes our orders, so we always receive them undamaged. Great bulk buy for cheese steak night. 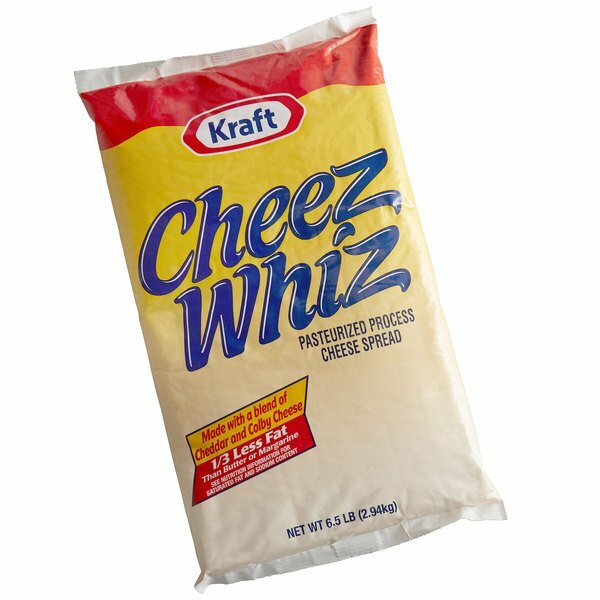 Cheez wiz is the original cheese for philly style cheese steaks. You have got to use this in order to be authentic. Great value. A great cheese spread that is perfect for using on numerous products. The cheese is rich and creamy and makes some really good nachos. A great and easy to use item.